This swap for those notorious fried onion appetizers is slightly more complicated than our other recipes -- but it is SO, SO, SOOOO worth it! And if you share this giant thing with 3 pals (instead of 1), each serving'll have just 96 calories and <1g fat. Rock on, Bloomin' Blossom! Preheat oven to 400 degrees. Combine ground cereal with the seasoned salt, garlic powder, and pepper. Mix well and set aside. Cut the top half-inch of the onion off (from the pointy side, not the flat one). Leaving the root (bottom) intact, carefully peel the outside layer off. Next, starting from the top, carefully cut the onion down and across the middle, stopping about a half-inch from the root. Repeat to make a criss-cross, cutting the onion down the middle again and stopping a half-inch from the bottom. You should now have 4 sections still attached at the bottom. Cut each of those sections down the middle (from the top), again stopping before you get to the root. Place the onion, cut side up, in a large bowl, and cover completely with ice water. Allow to sit for 5 - 10 minutes, or until "petals" open up. (You can use your hands to gently help pry them open once they've been soaking for several minutes.) Remove the onion, and dry both the onion and the bowl. Slowly sprinkle ground cereal mixture evenly over the onion, making sure to thoroughly coat each petal -- again, use your hands to separate them -- flipping the onion upside-down once you're almost done coating, so that the entire surface gets coated in crumbs. (If needed, spread a little more egg substitute on any dry spots to get the crumbs to stick.) Spray a baking dish with nonstick spray, and place the onion in it with the petals facing up. If you're alive and breathing (and we assume you are if you're reading your email), you probably have the desire (every so often) to order one of those ginormous deep-fried onion thingees served at chain restaurants. 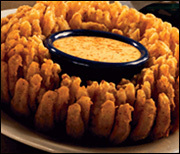 The 2,710-calorie appetizer is freakishly tempting -- it's lurking at your local Chili's and goes by the name Awesome Blossom. (And though Outback Steakhouse doesn't make their nutritional stats public, we're guessing the Bloomin' Onion there is at least as bad.) But what did you expect? It's an onion that's been hacked wide open (exposing WAY too much surface area) and then battered and fried. Every nook and cranny of that ginormous thing is covered in oily batter! And there's always one nutty person at the table who insists on ordering it. But be careful, because even nibbling on 1/6th of that thing (which isn't very much at all) would set you back more than 450 calories and over 33 grams of fat. Ahhhhhhh!!! The good news is that you can now whip up your very own diet-friendly version at home -- sauce and all. Yeee-haaaaaaa! Want More Fried Food Makeovers? Head to your local bookstore and snap up a copy of Hungry Girl: Recipes and Survival Strategies for Guilt-Free Eating in the Real World. You'll find lots of "fried" food recipes and so much more! We're officially dubbing today, June 24th, Faux-Fried Onion Day. 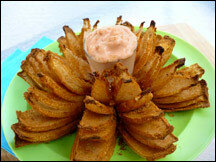 Feel free to celebrate with either our classic Lord of the Onion Rings or our brand-new Bloomin' Blossom! Share this onion-rific recipe with a bazillion of your close, personal pals. Click "send to a friend" NOW!